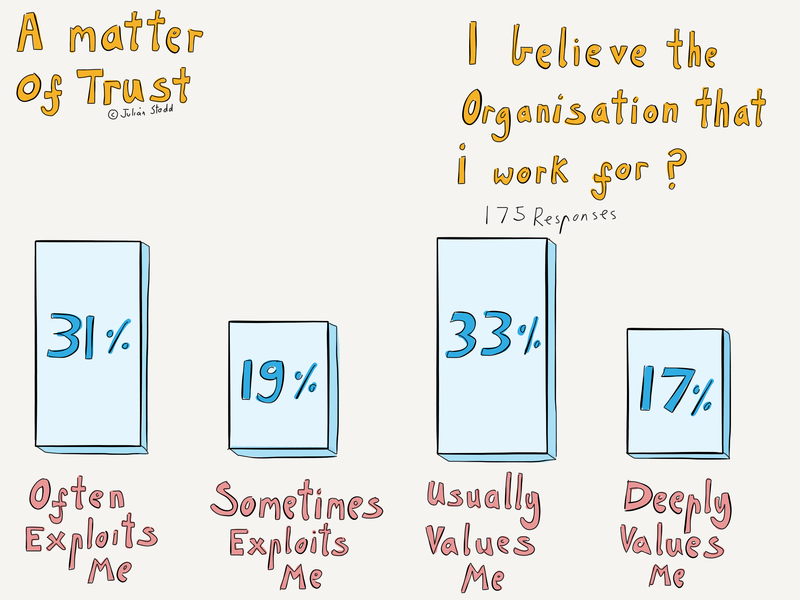 Over the last couple of weeks I’ve been exploring trust, looking at ways that we can quantify this highly subjective experience with the view to creating a baseline of what trust means to different people in different types of organisations around the world. My hope is that, from this work, I can produce some kind of diagnostic around the types of trust that exist within an organisation, and a view on whether these are functional, the bare minimum we need, or invested, the added value type of trust. In this, the second prototype question, I have asked people whether they feel exploited or valued by the organisation that they work for. Both the question and these initial results should be taken with a pinch of salt: my aim at this stage is simply to surface the notions that we will explore, and to identify opposing pairs. For example, is the pairing of exploitation and value a fair one? In the last piece of writing about this, I discussed how we run the risk of building a house of cards, one subjective understanding upon another. Whilst this is a possibly unavoidable feature of this type of work, the intention is less to provide some kind of fixed score, more to produce a kind of heat map that shows how one organisation differs from the baseline. This may suggest targeted interventions to build and earn trust. Let’s take an initial look at these results: 31% of people responded that their organisation often exploits them, 19% believed that the organisation sometimes exploits them, 33% believe the organisation usually values them, and 17% believes that the organisation deeply values them. There were 175 respondents to this prototype question, so slightly short of the 200 I am aiming for at this early stage. The most notable conclusion is this: if we add them up 50% of people believe that the organisation sometimes or often exploits them, and 50% of people believe that the organisation usually or deeply values them. We should be wary of taking any solace from this, because although the positive to negative balance is 50/50, 31% of people believed they were often exploited, yet only 17% believed they were deeply valued. Most opted for the bracket of usually being valued, so we could read into this that opinions are more polarised towards exploitation. However we choose to caveat this, and allowing for both sample size and imperfection of the prototype question, it is a surprising result, to me at least. One thing I try to hold true in this research is that people can hold multiple, somewhat contradictory, and concurrent views about the organisation that they work for. For example, in one context we may feel valued, yet in another context we feel deeply annoyed, or even exploited. In the two subsequent questions, which I will look at next week, I explore the notion of value and reward, part of producing a more granular and nuanced view of what trust really means to people. There is clearly more work to do to understand what people mean by exploitation, and to explore whether this self reporting of exploitation relates to one or two specific instances, or a wider sense of disquiet. From previous interviews, I have noted that often a failure and trust stems from one single incident, but this may not be a generalisable feature. The intention is to continue to explore a wide range of prototype questions, to expand out the framework of trust, using the notion of functional trust and invested trust, possibly introducing the notion of implicit trust as well. Once I feel the structure of the questions is right, I will build them into a survey to, and repeat the process, to see how replicable these early results are, and to explore cultural, or sector specific differences, for example, differences between Asia and America, or differences between military and industrial contexts. Once that is complete, I’ll try to prototype the diagnostic tool in a range of organisations, and see where that takes us. As ever, I am working out loud, sharing my thinking and learning as I go, I am happy if this thinking is incomplete, and happy to take feedback and thoughts on how to make it better. This entry was posted in Trust and tagged Community, Exploitation, HR, Leadership, Social Age, Social Leadership, Trust, Value, WorkingOutLoud. Bookmark the permalink.